Does the Temperature of Water Affect Swim Times? Does Drinking Warm Water Help You Lose Weight? What Are the Effects of Sports Drinks on Humans? Does Drinking Cold Water Help Speed Up Your Metabolism? 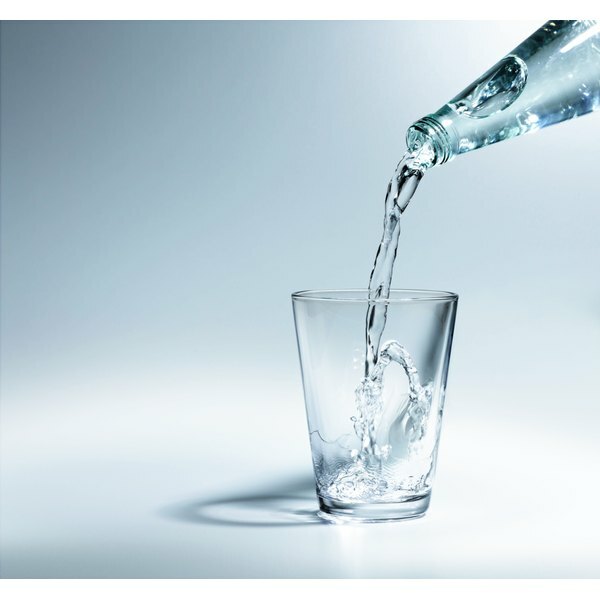 The idea that ice-cold water makes you lose weight is a long-lasting rumor -- but, unfortunately, not one that has many facts backing it up. Drinking cold water does burn a few more calories than regular room-temperature water but not enough to make a significant difference. If you prefer the taste of cold water and it helps you drink more water in general, however, it might help you lose weight. Water is essential in a healthy diet because it provides necessary hydration without increasing your calorie intake for the day. Water makes up a significant part of your tissues -- including muscle tissue, which has a higher proportion of water compared to fat tissue -- and staying hydrated helps maintain your blood pressure. Water plays an important role in a healthy body. It helps lubricate your joints so they move smoothly and without pain, helps deliver oxygen to your tissues to help produce energy and transports the nutrients your muscles and cells need to function. Dehydration, on the other hand, can make you feel fatigued and sluggish, which is far from ideal if you're trying to lose weight. It might seem intuitive that drinking icy water burns more calories -- after all, it takes energy to heat that water up to your body temperature after you drink it -- but it doesn't burn enough for significant weight loss. Even if you drank lots of water each day -- 10 cups -- and all of it was ice cold, you'd still burn just 80 to 90 calories heating it up to body temperature. While that added calorie burn can add up over time -- if you burned 80 extra calories every day for a year, you'd lose 8 pounds -- it's not the magic bullet for speedy weight loss. Drinking water in general -- cold water or not -- before a meal can help you lose weight, though, according to a study published in Obesity in 2011. The study authors looked at whether drinking a glass of water before a meal would affect the study subjects' calorie intake and weight loss. The subjects that drank water before their meals lost about 4.5 pounds more than those who didn't drink water before meals -- a 44 percent improvement in weight loss. They also ate less at their meals than those who didn't drink the water, and this might explain the greater weight loss. Water may also help you push hard during workouts, so you can burn more calories and lose more weight. One study, published in the March-April 2010 issue of the Journal of Athletic Training, found that even slight dehydration negatively affected runners performing in the heat. If you find yourself fading during workouts -- especially in the warmer months, when you're losing more fluid through sweat -- try upping your water intake to see if that helps. Exactly how much water you need can vary, but the University of Arizona recommends drinking 1 milliliter of water for each calorie you burn. If you need 2,000 calories to maintain your weight daily, that translates to 2 liters of water, or 67 ounces. You'll get the most weight-loss benefits from your water if you drink it in place of calorie-rich beverages. One study, for example, found that drinking a sugary beverage instead of water increased study subjects' calorie intake by 8 percent, explains a literature review published in Nutrition Reviews in 2011. That's the equivalent of 160 calories in a 2,000-calorie diet -- or enough calories to gain 17 pounds if you did it every day for a year. If you're currently drinking sugary beverages, swapping them out for water -- perhaps flavored with a squeeze of lemon juice -- will help you shed pounds. University of Washington: Mythbusters: Will Drinking Water Help With …? What Are the Health Benefits of Drinking Iced Green Tea During Your Bodybuilding Workout?